For so many people, when they imagine Christmas, it’s about being with family – sitting around the Christmas tree, unwrapping presents, eating a good meal together and possibly attending a church service. But there are tons of ways to celebrate this joyous holiday, especially if you’re with special people in your life. You don’t have to stay home; you could head out on a fun and memorable adventure together doing something everyone will enjoy. In fact, going on holiday can be part of your Christmas gifts to yourselves, experience something new together and we bet you’ll realise how much more meaningful it is than any material gift you might receive. Check out our ideas for how to have a different kind of Christmas holiday this year or future years. There’s no one way to celebrate Christmas so look through this list and see if any of these fun holidays is just what you and your favourite people should do for your next Christmas together. Since Christmas is in summer, it seems to just make sense to head to the beach to celebrate this festive time of year. Who wouldn’t want to make fun Christmas memories of hanging out at the beach, swimming and soaking up the sun (carefully, of course!)? Think about packing up some delicious food and using a nearby BBQ and picnic table to host an outdoor, causal Christmas lunch for you and your family or friends. Making memories of kids making sand castles on Christmas Day is exactly what taking a beach holiday is all about and why it’s a fun alternative to Christmas at home. Byron Bay, in particular, is known for having gorgeous beaches, from Main Beach to Whites Beach, you won’t be lacking in places to try out on your Christmas holiday to Byron Bay. Spend Christmas Day and the surrounding days getting back to nature by hiking through the beautiful Hinterland. Byron Bay boosts not only gorgeous beaches, but also amazing surrounding Hinterland that offers the chance to do some very memorable hikes. You and your family or friends could even plan a Christmas meal out during a hike — as mentioned in the post linked below there are picnic facilities at many of the hiking trails so you could eat a yummy meal while admiring the cool natural surroundings. Much more different than eating Christmas lunch around your dining room table! Everyone works hard all year long, so why not treat your special someone to a holiday away from the daily grind? And let’s face it, sometimes a Christmas with just your one and only might be a preferred way to spend the special day. Christmas is the perfect excuse to take your loved one away to relax and reconnect. And while you’re there, why not treat yourselves to some soothing services, like massages, yoga classes or even a unique tour that might involve yummy food? There are lots of ways to catch some romantic or secluded moments if you head to Byron Bay. We’ve collected tons of ideas from taking breakfast to the beach (like right outside your campsite if you’re staying at Broken Head! ), to a couples massage. Take some notes and make your list after you book your stay of what you and your loved one are going to do while you spend a most special Christmas holiday together in Byron Bay. Why not really make this Christmas holiday one for the ages? Bring the whole family or gather your closest mates and book a camping holiday for this Christmas. Spending time together in tents or even in a recreational vehicle will bring you together in a different way. 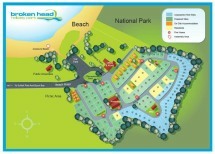 And we know just the place to book this awesome Christmas holiday: Broken Head Holiday Park, of course! Our excellent facilities will provide you with the perfect base to go and take in all that Byron Bay has to offer. Broken Head Holiday Park offers a range of accommodation styles to suit your budget. From our upgraded Beach Cabin with an En-Suite if tents aren’t your thing to a non-powered campsite where you can truly feel off the grid, Broken Head Holiday Park has whatever beach holiday experience you’re looking for in this Christmas holiday. Our facilities are well maintained and are constantly being improved, all aimed at increasing your enjoyment when you take a few precious moments out of your lives to kick back and relax. So stop thinking about it, just go for it and set up a camping Christmas holiday for you and your loved ones! Try out Byron Bay surfing. Let’s just remember that it’s summer, people. In other areas of the world, they are hoping for a White Christmas. They wear jumpers and wrap up in blankets around the fire. But that’s not how we celebrate Christmas in Australia. It’s warm, we often can wear shorts and we might not really want hot meals. So why not embrace it and do something totally different and fun on Christmas? Go surfing! Byron Bay happens to have some of the world’s best surfing locations, so if you’re up for this unique Christmas holiday of hanging ten, then make plans to head here. Take some time to familiarise yourself with the surfing culture here in Byron Bay with the following post and then book your Christmas holiday here. Is your family filled with thrill seekers? What about doing something totally different for a Christmas holiday this year (or sometime down the road)? Between Wet ‘n’ Wild, Whitewater World, DreamWorld, Warner Bros. Movie World and Sea World, it’s no wonder that the Gold Coast is called the Theme Park Capital of Australia. With so many choices it might be hard to narrow down which places to hit during your holiday. So you’ll want to do your research and figure out which ones you really must try, and keep in mind, most are closed on actual Christmas Day. If you’re going to be there for several days, you might want to purchase a combined pass. And no need to worry, there’s plenty to do in the Gold Coast area and some excellent restaurants that would serve up a great Christmas lunch if you’re so inclined. Are you and your friends foodies? Can’t get enough of trendy restaurants, savouring delicious meals and planning your next meal? Byron Bay would make an excellent destination for your Christmas holiday then, as you won’t be lacking in a variety of top-notch restaurants to get amazing grub. The diversity and delicious food available at Byron Bay restaurants is astounding–you’d have to stay for months in order to try all the amazing restaurants that Byron Bay has to offer. So you’ll want to do your homework and pick the venues that most interest you on this holiday (and then plan on coming back again!). We have several lists that would help in your planning so try not to get too hungry as you decide which restaurants sound the most appetising! Rather than spending the Christmas holiday stuck at home or visiting family, think about packing up the family and taking a fun Christmas road trip. The first one we’d suggest is the drive from Sydney to Brisbane — there’s a ton to see along the way and lots to do once you land in your destination. The Sydney to Brisbane coastal drive, dubbed the Legendary Pacific Coast, ranks as one of Australia’s top road trips. With plenty to see between these two cities, it’s easy to see why people like to take their time driving the 900 or so kilometres. We put together a list of places to stop and stay along the way as well as a few suggestions on what to do when you’re in each location. So take your time and look through the list, figure out where you’d like to stop for the actual Christmas holiday (we suggest Byron Bay!) and then plan the rest of the holiday. Another option is Brisbane to Bryon Bay, which is a short drive, so if you plan to make some stops along the way, then you won’t be spending much time in the car, but rather enjoying each location along the way. Check out our blog post on this road trip with all kinds of tips on where to stop and what to do in each town. If you and your friends or family are animal fanatics, then you might think about creating a holiday based on seeing as much of Australia’s cool wildlife as possible. From koalas to dolphins, and turkeys to frogs, you can see lots of interesting animals if you plan a trip to Byron Bay. While Christmas isn’t the time of year to view whales migrating (Byron Bay is an excellent location to view them in season! ), you can still see quite a few animals during a Christmas holiday here. If you’re a fan of sea life, plan a snorkelling trip to Julian Rocks Marine Reserve where you’ll likely see sea turtles and lots of exotic fish. If you take a Go Sea Kayak excursion, then you’ll be able to spend time up close with dolphins. And there are lots of animals to see on the land, too! You can read more about viewing Byron Bay Area wildlife in our post. If you decide to visit Byron Bay on your Christmas holiday this year, then you might want to look over this list of day trips from Byron Bay. There are tons of fun things to do in Byron Bay, but there are also lots of cute little towns surrounding Byron Bay proper that are worth visiting. It might be fun to try to pick a couple out to hit up during your Christmas holiday in the area, and maybe even make reservations ahead of time to have Christmas lunch at a fun restaurant in a nearby town. If you read through this blog post, you’ll see we have noted tons of suggestions for what to do during the day and where to eat. Happy planning! So, as you might have noticed, we’re pretty sure you should book a Christmas holiday in Byron Bay. Plan on making the most of your travel budget by booking with us at Broken Head Holiday Park for part or all of your holiday. We can’t wait to host you and your loved ones for a memorable Christmas holiday whether it’s this year or next!